Mason Cru provides awesome options for your winter, spring, and summer breaks, as well as a chance to get away each semester to just relax, have fun, and grow spiritually. You and any friends you care to bring are invited! 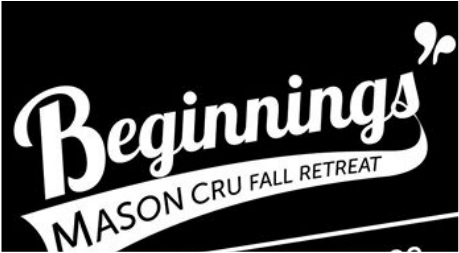 Fall Retreat is an awesome event that Mason Cru hosts every year, after the craziness of move-in and the start of classes subsides. Anyone who's interested is invited to come away for the weekend to relax, make new friends, and enjoy the fall weather. Each retreat boasts great teachers, times of worship, fun activities, and lots of hanging out, pick-up sports, campfires, and enjoying nature. Cru Winter Conference is Cru's amazing winter break conference, held annually in a luxury hotel in Baltimore, MD. 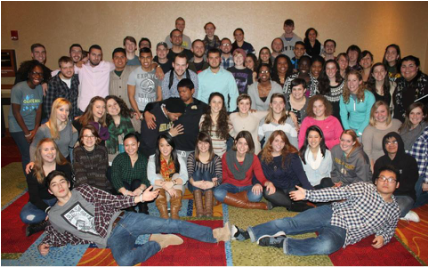 It is with Cru students from all over the Mid-Atlantic Region. The conference lasts from December 28th to January 1st, and we have a gigantic dance party/concert on New Year's Eve and then worship in the New Year with 1000+ people. This conference is a favorite among Cru students, and features great speakers, lots of fun activities, and tons of opportunities to get connected to what Cru is doing regionally, nationally, and internationally. During spring break every year, dozens of Mason Cru students travel together to Panama City Beach to take part in Big Break, Cru's national spring break conference. Big Break is about two things - having an awesome time on the beach, and ministering to the millions of other spring-breakers who are there. This conference has a special focus on training our students to share their faith with their peers who are in PCB for a more traditional spring break. Big Break is an incredible time for community and seeing God at work in people's hearts! Definitely check out Big-Break.com to see what its all about. Each year, towards the end of the spring semester, we invite everyone involved in Mason Cru to the overnight Spring Retreat. There are two focuses to this retreat: preparing students to stay strong in their faith over summer, and planning our fall semester schedule of events for incoming freshmen. It's a great chance to connect with people, relax, and have some say in how we plan to make our community a fun and comfortable place for everyone who wants to join as they start their college career. In August, we all reconvene before the semester begins to finalize details and get caught up on life together. Locate the Conference Team on our Ministry Teams page and contact the leaders for specific details. 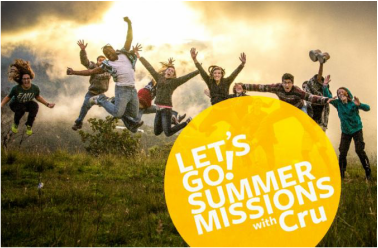 Summer Missions offer amazing opportunities for adventure and ministry. Stateside, there are dozens of beaches and cities you can spend your summer at, making great friends and growing in your faith. Check out places like Ocean City MD, San Diego, NYC, Hampton Beach NH, Anchorage AK, Lake Tahoe, and dozens more. Internationally, you could go to just about any country on Earth. Mason Cru has special partnerships with places in Central Asia, East Asia, North Africa, Dominican Republic, Botswana, and Australia.